Pharmacists work to prepare medicines according to prescriptions as well as instruct patients on correct dosage methods at hospitals and pharmacies. At a pharmaceutical manufacturing company, you may be involved in the development of new drugs, or provide information on pharmaceutical products to people involved in health care as a medical representative (MR). Established in 1972, the Faculty of Pharmaceutical Sciences aims to have students acquire the knowledge and skills required for pharmacists as healthcare professionals, cultivate bachelors of pharmaceutical science with problem-solving abilities necessary for meeting medical needs from society, and train pharmacists with sophisticated expertise and skills. A 6-year program dedicated to training pharmacists to work in a clinical setting. Designed around the five areas of biopharmacy, molecular pharmacy, physical pharmacy, social pharmacy, and clinical pharmacy, the Faculty’s program endows students with the knowledge, skills, and attitude they’ll need as a pharmacist through a curriculum and program of practical study that are designed to progress systematically from the basics to specialized subjects, as well as through a graduate research project that utilizes the University’s state-of-the-art facilities. A robust program of overseas exchange opportunities designed from the student’s perspective. Students regularly participate in training at partner institutions on the East Coast and West Coast of the U.S. (including at Pacific University and the University of California). They also tour nearby medical facilities, where they learn about the latest techniques in clinical pharmacy and expand their international perspective. 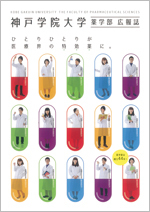 In addition, pharmacy students from partner institutions come to Japan as part of an active program of multicultural exchanges. Extensive club activities for the Faculty’s students. Students can choose from an extensive menu of sports and cultural activities. The Faculty’s semi-hardball baseball club has been recognized as among the best 9 teams in the Kansai Medical Baseball Association’s league, and its soccer club has been recognized as among the best 11 teams in the Kansai Medical Football Association’s league. In addition, its science club holds events for children that are popular with residents of the surrounding area. The Faculty of Pharmaceutical Sciences sees pharmacists as having to be "healthcare professionals committed to serving others" and therefore works to develop pharmacists as individuals with the highest of qualities, who are contributors to society. To meet this objective, we offer students hands-on learning opportunities right after admission to promote cultivation of their communication ability and understanding of the nature of this profession. The freshman year is devoted to basic studies and the second through fourth years to specialized education. 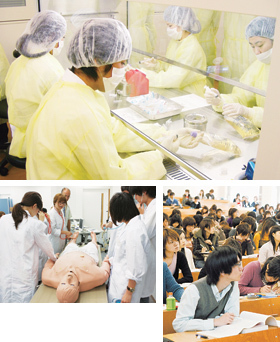 In the fifth year, a five-month practical training period in a hospital and dispensing pharmacy is arranged. In the sixth year, more advanced professional training is provided, and an assigned research program leading to graduation is offered. The faculty offers across-the-board support to students by leveraging expertise gained from more than 40 years of passionate guidance and work to ensure students pass national certification examinations. Faculty members offer fine-grained guidance through lectures on how to prepare and simulated examinations based on individual students’ level of preparation. We help students prepare to continue their studies at their institution of choice, regardless of whether they are pursuing admission by means of a recommendation program targeting specific schools or the general public or by entrance examination. In addition, we offer an extensive range of examination preparation measures and job search support for enrolled students.